Asterix and Obelix bedclothes collection with comic and movie characters of two brave Galus: a small inconspicuous Asterix and a well-built but somewhat obese Obelix facing stubborn Romans. Brave warriors with the help of magical brews prepared by Druid Getafix defend their Gallic village and its inhabitants. 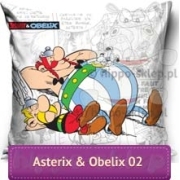 Bedding with Asterix and Obelix in all sizes, kids bath towels, blankets and pillows and accessories for comic book and films fans who like two valiant Galus and his adventures.